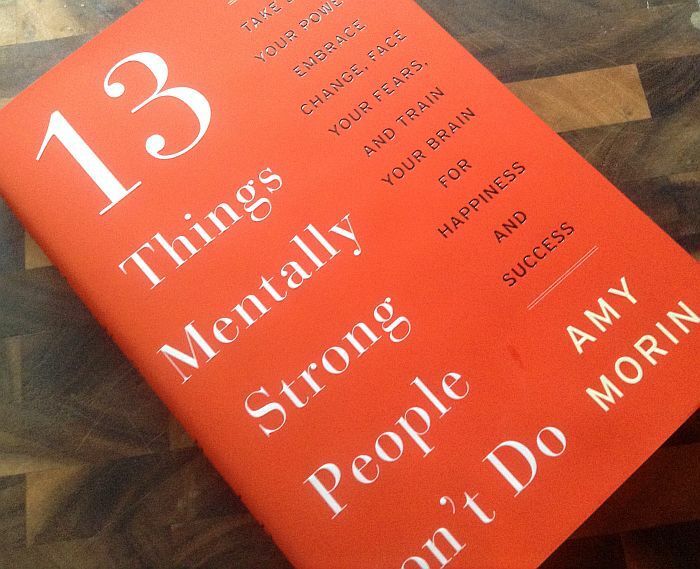 For only $2.99 you can get the fantastic book "13 Things Mentally Strong People Don't Do". Click here to buy the digital book on Amazon. 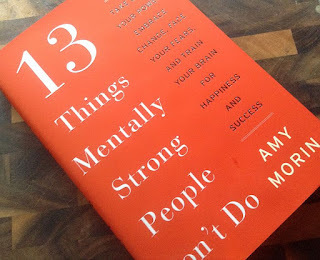 Even if you have zero interest in "self-help", this empathic book by psychotherapist Amy Morin offers extremely constructive advice on how to deal with challenges and disappointments. I recommend getting it now, before the price goes back to the usual $16.99. "Take back your power, embrace change, face your fears, and train your brain for happiness and success." Mentally strong people avoid giving others the power to make them feel inferior or bad. They understand they are in control of their actions and emotions. They know their strength is in their ability to manage the way they respond. Mentally strong people embrace change and they welcome challenge. Their biggest “fear," if they have one, is not of the unknown, but of becoming complacent and stagnant. An environment of change and even uncertainty can energize a mentally strong person and bring out their best. 4. They Don't Waste Energy on Things They Can't Control. Mentally strong people don't complain (much) about bad traffic, lost luggage, or especially about other people, as they recognize that all of these factors are generally beyond their control. In a bad situation, they recognize that the one thing they can always control is their own response and attitude, and they use these attributes well. 5. They Don't Worry About Pleasing Others. Know any people pleasers? Or, conversely, people who go out of their way to dis-please others as a way of reinforcing an image of strength? Neither position is a good one. A mentally strong person strives to be kind and fair and to please others where appropriate, but is unafraid to speak up. They are able to withstand the possibility that someone will get upset and will navigate the situation, wherever possible, with grace. A mentally strong person is willing to take calculated risks. This is a different thing entirely than jumping headlong into foolish risks. But with mental strength, an individual can weigh the risks and benefits thoroughly, and will fully assess the potential downsides and even the worst-case scenarios before they take action. There is strength in acknowledging the past and especially in acknowledging the things learned from past experiences—but a mentally strong person is able to avoid miring their mental energy in past disappointments or in fantasies of the “glory days” gone by. They invest the majority of their energy in creating an optimal present and future. We all know the definition of insanity, right? It's when we take the same actions again and again while hoping for a different and better outcome than we've gotten before. A mentally strong person accepts full responsibility for past behavior and is willing to learn from mistakes. Research shows that the ability to be self-reflective in an accurate and productive way is one of the greatest strengths of spectacularly successful executives and entrepreneurs. It takes strength of character to feel genuine joy and excitement for other people's success. Mentally strong people have this ability. They don't become jealous or resentful when others succeed (although they may take close notes on what the individual did well). They are willing to work hard for their own chances at success, without relying on shortcuts. 10. They Don't Give Up After Failure. Mentally strong people enjoy and even treasure the time they spend alone. They use their downtime to reflect, to plan, and to be productive. Most importantly, they don't depend on others to shore up their happiness and moods. They can be happy with others, and they can also be happy alone. Particularly in the current economy, executives and employees at every level are gaining the realization that the world does not owe them a salary, a benefits package and a comfortable life, regardless of their preparation and schooling. Mentally strong people enter the world prepared to work and succeed on their merits, at every stage of the game. Whether it's a workout plan, a nutritional regimen, or starting a business, mentally strong people are “in it for the long haul”. They know better than to expect immediate results. They apply their energy and time in measured doses and they celebrate each milestone and increment of success on the way. They have “staying power.” And they understand that genuine changes take time. 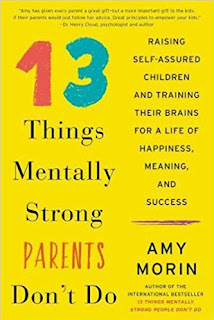 If you are a parent, also get her other very useful title "13 Things Mentally Strong Parents Don't Do". "Raising self-assured children and training their brains for a life of happiness, meaning, and success." Guilty feelings can lead to a long list of unhealthy parenting strategies — like giving in to your child after you've said no or overindulging your child on the holidays. Mentally strong parents know that although guilt is uncomfortable, it's tolerable. They refuse to let their guilty feelings get in the way of making wise choices. It can be tempting to make your life revolve around your child. But kids who think they're the center of the universe grow up to be self-absorbed and entitled. 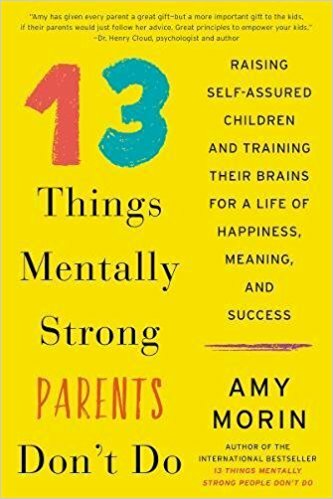 Mentally strong parents teach their kids to focus on what they have to offer the world — rather than what they're owed. Keeping your child inside a protective bubble could spare you a lot of anxiety. But keeping kids too safe stunts their development. Mentally strong parents view themselves as guides, not protectors. They allow their kids to go out into the world and experience life, even when it's scary to let go. Kids who dictate what the family is going to eat for dinner, or those who orchestrate how to spend their weekends, have too much power. Becoming more like an equal — or even the boss — isn't healthy for kids. Mentally strong parents empower kids to make appropriate choices while maintaining a clear hierarchy. You won't catch a mentally strong parent saying things like, “I don't want to burden my kids with chores. Kids should just be kids.” They expect children to pitch in and learn the skills they need to become responsible citizens. They proactively teach their kids to take responsibility for their choices and they assign them age-appropriate duties. It's tough to watch kids struggle with hurt feelings or anxiety. But, kids need practice and first-hand experience tolerating discomfort. Mentally strong parents provide their kids with the support and help they need coping with pain so their kids can gain confidence in their ability to deal with whatever hardships life throws their way. It can be tempting to cheer your kids up when they're sad or calm them down when they're angry. But, regulating your kids' emotions for them prevents them from gaining social and emotional skills. Mentally strong parents teach their children how to be responsible for their own emotions so they don't depend on others to do it for them. Whether your child gets a few questions wrong on his math homework or he forgets to pack his cleats for soccer practice, mistakes can be life's greatest teacher. Mentally strong parents let their kids mess up — and they allow them to face the natural consequences of their actions. Punishment is about making kids suffer for their wrongdoing. Discipline is about teaching them how to do better in the future. And while mentally strong parents do give out consequences, their ultimate goal is to teach kids to develop the self-discipline they'll need to make better choices down the road. In today's fast-paced world it's easy to get wrapped up in the day-to-day business of homework, chores, and sports practices. Those hectic schedules — combined with the pressure to look like parent of the year on social media —cause many people to lose sight of what's really important in life. Mentally strong parents know their values and they ensure their family lives according to them.